This Rustic wooden outdoor garden planter has a sleek, classic design. 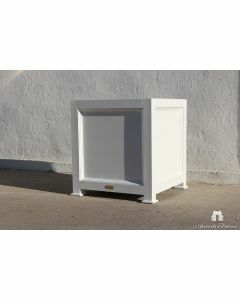 It is made of Douglas fir white oak and is finished with an exterior acrylic paint. 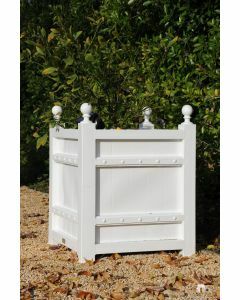 The planter is available in sizes 15”, 20”, 24” and 26”. Size specifications below. The standard colors are dark green and white. Prices reflect the cost for standard colors and standard round or acorn finials. 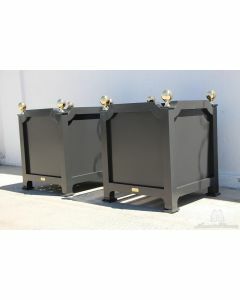 The images shown are of custom planters. This planter can come with acorn, round, stainless steel or brass finials. 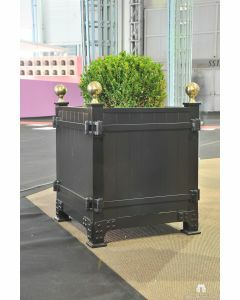 The planter also comes with an optional metal liner that can be purchased separately. The liner is perfect for prevention of water damage and rot and will prolong the life of the planter. Please note, this item is custom made to order and cannot be returned. The design, dimensions, material and color can be customized upon request. Please select customization options from the drop down menus below. Additional fees may apply. Click on image for greater detail.